I’m happy to share an interview with a personal finance blogger who has made the leap to author – Kim Palmer. Writing at US News and Report, Kim covers personal finance with Alpha Consumer where she tackles handling money and building a better financial future. If you have a few minutes you should check out some wonderful posts for couples looking at improving their finances. 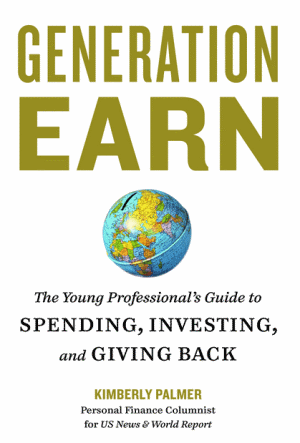 Her new book out, Generation Earn, is getting some fantastic reviews so wanted to ask her some questions about the topic and process behind it. She was gracious enough to answer all questions I had. I hope you enjoy the interview as much as I do. I appreciate how you point out that young professionals are stereotyped as being financially irresponsible. What do you think is the source of this misconception? The idea that young people are defined by their debts started coming up several years ago, when credit cards and high-interest student loans began being marketed more heavily to college students. Media pundits, especially older ones, love to talk about how clueless we are about money. What was your motivation for writing about personal finance for college graduates and young professionals now? I felt really frustrated by that stereotype and wanted to prove it wrong. I heard from a lot of young people who, like me, wanted to focus on the more positive side of money – how to be financially secure, support their families, and also give back to the community. I wanted to help them do those things. As far as a financial system for bills, savings, and investing, how do you handle it? Most of my investments are in my retirement accounts, so I keep it pretty simple by sticking with index funds. As I get older, I’m slowly shifting more into bonds and other conservative investments. At my house, I’m in charge of all the bills – I love paying them, it’s very satisfying – and my husband handles our insurance and investment paperwork. We work on our savings together, but since we just bought a house and had a baby, we’ve been saving less. What do you think is the most common mistake couples make with their money? How do you think they can fix it? Ignoring the topic altogether. It can be awkward so people avoid bringing it up. But it’s so important to find out about the other person’s habits and goals. Do they rely on credit cards? What are their long-term financial goals? You don’t want to be surprised later! I like the idea of talking in a neutral spot, like a coffeeshop, to get all the awkward questions out of the way. As a site on family and finances, I’m curious – how hard do you think couples can both keep their lifestyle voluntarily simple? Keeping finances simple is tough, especially as things get complicated with mortgages, college savings accounts, etc. I like keeping all the paperwork in one place for starters. Then, I like scheduled a check-in every few months just to make sure you know where you’re money is and it’s in a smart place. Lastly, a key is to resist buying too much stuff. It’s so easy to fill up your home with unnecessary purchases that you forget about a month later – don’t do it! What is one financial mistake that you made, and what did you learn from it? I still get mad thinking about my car purchase. I feel like I let myself get pressured into spending too much because the car dealership was so aggressive. Never again will I let that happen! I will go in more prepared and shop around more in advance – and be willing to walk away. Last question, what advantages do you think young professional have now compared to other generations in regards to their finances? As hard as it was, I think we learned a lot from the recession: How to be more frugal, value-conscious, and smart about investing and the economy. Maybe in 10 years we’ll be grateful for the experience. I want to thank Kim for taking the time out of busy schedule to share her thoughts. If you want to learn more, please check out her new book Generation Earn out now.